I get these pesky reminders all day. I don't want to use NRT to kill the app. I saw post about an opt-out option on screen. I do not see any opt-out option. If you have disabled backups, that should kill the reminders but it does not. I use Acronis to backup my PC's. Re: How do I stop Backup reminders? I don't want to use NRT. I disabled backups in settings. 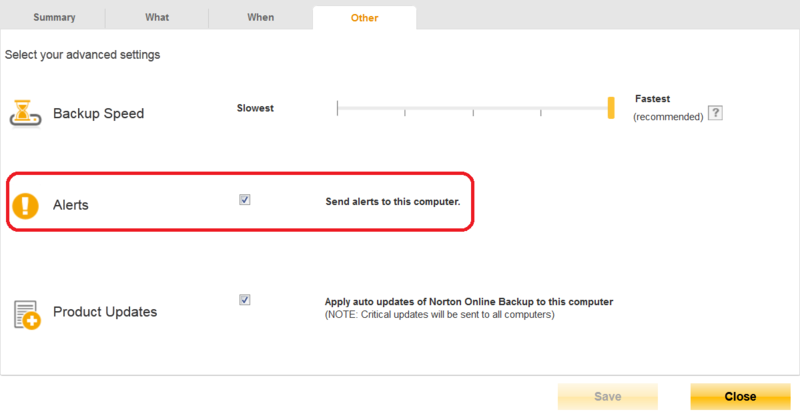 If you want to disable the Backup alerts from Norton Online Backup, you can do it in Settings. 1. Sign in to Norton Online Backup website. 2. Next to the computer icon that you want to disable the alerts for, click Settings. 3. On the "Other" tab, next to "Alerts", uncheck the checkbox to disable the alerts. How do I stop the backup reminders WITHOUT disabling the backups completely? I have set it up to back up to a USB drive yet because I do not want the on-line backup it STILL keeps telling me I have not set it up and backed up my files. I ONLY want to backup to hardware/devices of my own. There is no freaking way I am going to backup to something floating around out there that I don't have the least bit of control over. Never mind. I can't find a way to delete my post so just disregard it. Something else I installed (codecs) wants me to use there backup service. I was misled into thinking it was a Norton backup because there was somekind of Norton logo on the setup screen. I uninstalled that backup service - which took the codecs with it - and those annoying reminders went away.